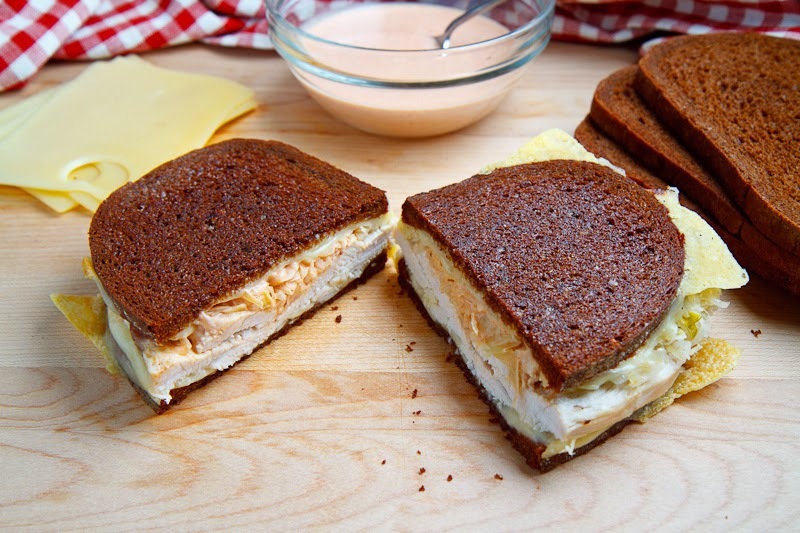 A twist on the classic Reuben sandwich with roast turkey, creamy coleslaw or sauerkraut, tangy russian dressing and swiss cheese in rye that is grilled until golden brown and the cheese has melted. I made a ton of food over the holidays and of course that means there were a lot of leftovers. One leftover I am always happy to have is some leftover roast turkey as I can’t get enough of those roast turkey sandwiches . Over this last weekend I got the chance to dig into the last of my roast turkey leftovers and this time I used them to make some Rachel sandwiches which are a variation on the Reuben sandwich . There are several different versions of the Rachel including replacing the corned beef with turkey or pastrami and the sauerkraut is sometimes replaced with coleslaw. I could not really decide which version sounded the best so I tried both a turkey with sauerkraut version and turkey with coleslaw version. Since coleslaw is already in a dressing I saw no need for there to be two so I also tried a version where I replaced the coleslaws dressing with the Russian dressing for a turkey and Russian slaw Rachel. Feel free to use either light or dark rye bread. Tip: With the sauerkraut or coleslaw in the sandwich along with the dressing, these sandwiches can get a little wet and you really don’t want you sandwich falling apart before you finish it. Luckily there are a few things that you can do to fix this problem starting with lightly toasting the bread first. If you are using sauerkraut, you can squeeze it well to remove any excess moisture and you can then saute it for a few minutes to remove the rest. 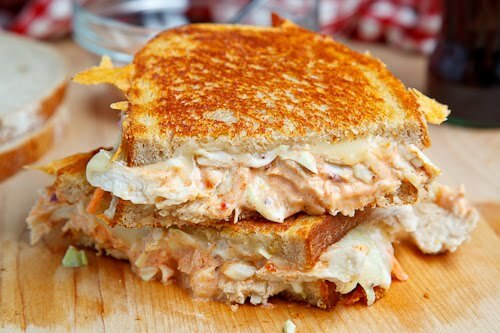 Butter the outside of each slice of bread, sprinkle half of the cheese on the inside of one slice of bread, top with the turkey, coleslaw or sauerkraut, dressing, the remaining cheese and finally the other slice of bread. Add the sandwich and grill until golden brown and the cheese has melted, about 2-4 minutes per side. Mmmm! This looks just as yummy as the turkey burger I just ate! turkey was by far one of the hardest things to give up when i went vegetarian! now its back in my life and oh so yummy! i'm all over that dressing. i could use that for everything. did you ever make a pastrami or rueben hash? Reubens are quite possibly my favorite type of deli sandwich but sometimes I feel they're too heavy. A Rachel sounds like the perfect substitute! What a fabulous sandwich! I am on a sandwich kick and will definitely try this sucker. I love that sandwich and haven't had it in forever! Thanks for sharing! I agree that toasted bread is key. It also makes the bread more flavorful IMO. I love Rachels, almost as much as Reubens– and that's saying something! Looks soooo delicious! 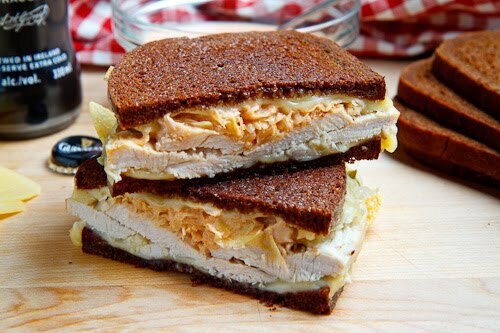 A marvelous Turkey Reuben! I love the idea. Perfect for using leftovers. This is timely. My husband got me Rachel Ray's latest cookbook for Christmas and just tonight I was thinking about trying one of her "sammies." Çok leziz ve iştah açıcı görünüyor. Ellerinize, emeğinize sağlık. Que maravilla de sandwich, que lujo. That looks creamy and satisfying! mmmm….delicious use of the leftovers! I could have one right now! why does everything you make look so yummy……….!!?!? Reubens are my absolute favorite. Thanks for posting this alternative. I will have to try it. Thanks for the homemade recipe of the Russian dressing, I'll have to try. It's nice that you are using rye bread in this recipe. Looks appealing and delicious. Yum! My fiance has been begging me to make Reubens, but now I might have to make a Rachel instead 🙂 Looks fabulous! A sandwich that's toasted on the outside and gooey on the inside is a sandwich I want to eat!!! I'll have to give this a try! 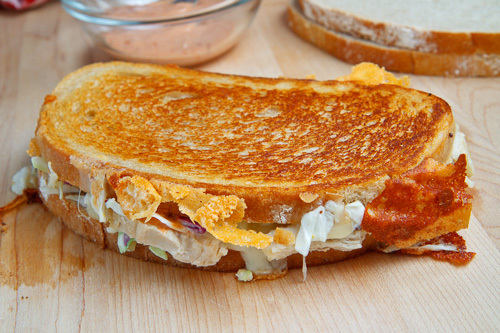 This looks delish, have never had a sanwich like this. Will try soon. Fabulous sammie Kevin…nothing better than a good turkey sammie, looks great! Wow, what an innovative way to use up leftover roasted turkey! Wow this rueben seems so interesting! Thank you so much for sharing. Can’t wait to make it at home. Love sauerkraut and turkey!